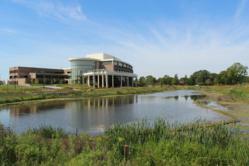 Delta Dental of Michigan LEED certified Headquarters - Okemos, Mich. The project serves as an outstanding example of energy efficiency, appropriate land use, and recycling. As a result of Delta Dental of Michigan’s strong commitment to the environment through its recent “green” corporate headquarters’ renovation and expansion, the company has recently been awarded LEED® (Leadership in Energy and Environmental Design) Gold certification established by the U.S. Green Building Council and verified by the Green Building Certification Institute (GBCI). LEED is the nation’s preeminent program for the design, construction and operation of high performance green buildings. In addition to this major achievement, the company has also received a 2012 Michigan Green Leader Award by the Detroit Free Press. In recognition of Earth Day, this annual program honors companies, individuals and organizations within the state that are working toward sustainable environmental practices. Delta Dental’s $91 million project included the construction of a new 90,000 square-foot office building, as well as the renovation of the original headquarters, including its expansion from 160,000 to 188,000 square feet. In addition, a new 22,500 square-foot data center was built at the east end of the property. An estimated 40 subcontractors worked on the project, creating 884 construction jobs. Construction began in 2008 and was completed August 2011. The project serves as an outstanding example of energy efficiency, appropriate land use, and recycling. The corporate headquarters achieved LEED certification based on all of these factors. By using less energy and water, LEED certified buildings save money for families, businesses and taxpayers; reduce greenhouse gas emissions; and contribute to a healthier environment for residents, workers and the larger community. Use of recycled building materials. Large windows to maximize natural lighting. Use of bioswales and plant material on the roof to minimize storm water runoff and provide natural thermal insulation. Rejuvenated grounds with native ground covers, prairie grasses, wildflowers and trees. The development and maintenance of a native wildlife habitat. An increased pond surface area (Ingham County’s Smith Drain) to provide nearly 160,000 cubic feet of additional storm water storage for the community. Delta Dental of Michigan, Ohio and Indiana, with its affiliates in Kentucky, New Mexico, North Carolina and Tennessee collectively are among the largest dental plan administrators in the nation. In 2011, the enterprise paid out $2.2 billion for dental treatment for 8.6 million enrollees. Offices are located in Okemos and Farmington Hills, Mich.; Columbus and Cleveland, Ohio; Indianapolis and Greenwood, Ind. ; Louisville, Ky.; Albuquerque, N.M.; Raleigh and Charlotte, N.C.; and Nashville, Knoxville and Memphis, Tenn.
For more information, visit http://www.usgbc.org.